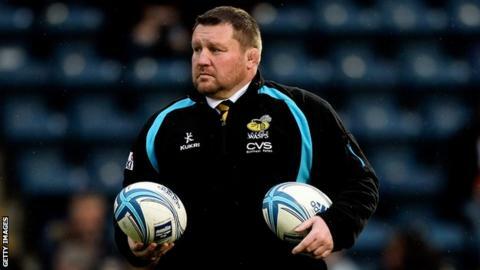 London Wasps rugby director Dai Young denies his team are disadvantaged by facing Stade Francais away second in this month's European Rugby Champions Cup play-off. The two teams are playing off to decide who gets the 20th place in next season's inaugural Champions Cup. But Young is sure playing in Paris second will not be a factor. "It's not something we're too concerned about. It's something we're really looking forward to," Young said. Wasps are guaranteed seventh place in the Premiership ahead of their final game of the season away to Northampton on Saturday, while Stade Francais have already wrapped up the same position in France's Top 14. Previously, only the top six in England qualified for the Heineken Cup, Europe's top event which is ending this season. Wasps host Stade at Adams Park on 18 May before the return match in Paris on 24 May. Young added: "Stade have got a quality team that's used to playing home and away, so we'll have to be at our best to qualify. "A month or six weeks ago we didn't feel we had this opportunity anyway, so we're just really pleased to be given another shot of maybe playing in the top competition in Europe next season."